Chiefs FC is celebrating 11 years of youth soccer in the Atlanta-metro area this June. With continued progress, we are expecting growth with our programs across all age groups. To support this growth, Chiefs FC expanded its facility use at Silverbacks Park going into the Fall 2013 season to accommodate the expanded programs, and expects to continue with this in the Fall 2019 - for both practices and games. Silverbacks Park has become the primary practice location for 18U-19U (5:00pm-6:30pm) teams and is host to a majority of the home games for these age groups. 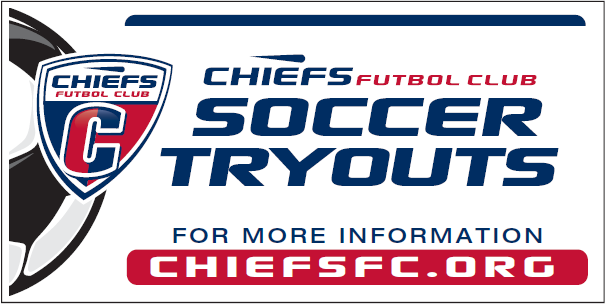 Anyone wanting to tryout for a Fall 2019 Chiefs FC team must PRE-REGISTER online, starting April 15th. Register for ONE team only. A confirmation email is sent when you register online. also email Executive Director Neil McNab Jr.
submitted BEFORE May 15th to be considered. New players must have a completed form with accompanying tax forms before tryouts begin. Financial Assistance Form: click on our APPLICATION. Goalkeeper specific training available at tryouts to evaluate Academy/Select goalkeepers and help place them on appropriate level teams. Goalkeeper training is available throughout the season, at no cost. Athletic trainers onsite during practices and games. Player safety is of huge importance to the program. A specific aim of our select program is to have all same age select teams have the same practice schedule. This enables visibility for our 2nd, 3rd team members to the Premier team coaches and players. Chiefs FC utilizes the club pass system to further develop players at all levels. New families (who are not already in the Chiefs online system) will need to create a family account first . You will then add your player and register your player for a team tryout. You only need to register for ONE team for tryouts. Once properly registered, you will receive an order confirmation email to confirm registration. A current Fee Schedule will be attached to your tryout confirmation email. Returning players should log into your existing account. Make sure you contact information is up to date. To check the status of your account once established, click on the "LOGIN" button in the top right corner of the page. You will need to enter the username and password that you entered when you first created your account. If you can not remember your login information, please click “login” in the top right, then the “Forgot Your Username and Password” button and enter the email address used to create the account. Chiefs Futbol Club has a NO refund policy once the player has been registered on a team with the State Association, with the following being the ONLY exception: the player becomes injured to the point that they cannot play the remainder of the season and presents a doctor’s note to the club. In this case, the refund will be prorated for the remaining sessions the player cannot attend. If you have questions about the program please contact Neil McNab Jr [email protected] for more details. (Players born 2007) Tryouts for 13U Select Boys and Girls. If you missed tryouts or have questions about the program please contact Neil McNab Jr [email protected] for more details. Post Tryout Follow Up All Academy players will be contacted via email with instructions for the next steps in the process, once tryouts conclude. All 13U Select players will be contacted via phone, within 72 hours of tryouts concluding. There will be on going opportunities for players who missed tryouts to check out the program. Please contact Neil McNab [email protected] for more information. Online registration will open on June 3. June 7 will be the rain make up session. all sessions are at Pleasantdale Park. Online registration will open on June 10. What age groups is my child in? A player may play in his/her proper age group, or in an older age group. A player may NOT play in a younger age group. For regular-season play, once rostered to a team, a player is considered to be the age of that team. *Select program team division placements are determined by Georgia Soccer, once all team declarations are submitted in July. ** Remember that all teams move up by one year going into tryouts. The teams listed above represent the teams going into the Fall 2019 Season. *** Additional teams will be formed if tryout numbers support it. Chiefs FC prides itself on being a premier youth club for coaching development and for providing coaching consistency and continuity throughout the program to manage player development and the overall experience of Chiefs players. In order to make the Chiefs Way a reality on every team for every player, regardless of ability or level of team, the Chiefs FC embarked on a major coaching development initiative three years ago under the leadership of the McNab coaching trio. The Chiefs Way Coaching Development program is a major investment by our club - one we believe is among our most important, as it directly impacts the development of well-rounded youth soccer players. Providing a well-defined set of player development standards, expecting a high level of professionalism by all coaches for every team, and providing meaningful feedback and support to every coach are the ingredients to being in the position to develop players at all levels of play to best of their ability AND to have fun with soccer in the process. We whole heartedly believe Chiefs FC is a great place to play and coach soccer and we work hard together every day to bring that mission to reality.